Gift Opening and CHAT NIGHT has been changed. Join us in our Group Chat on Sat. Dec. 27 at 8:00pm CST for our Secret Santa chat and GIFT OPENING. 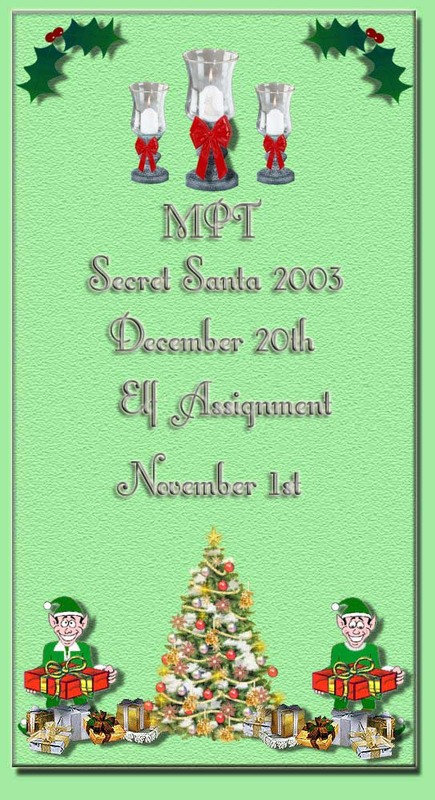 Don't forget to add your name to our Christmas Card list so you can give and receive cards with MPT members. 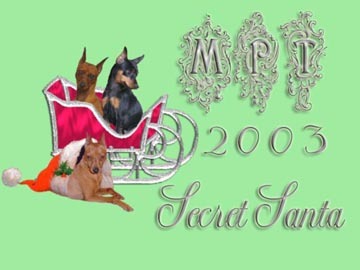 Visit MPT Christmas Cards to find a list of names and addresses. 1) Your home mailing address is best in case your Secret Santa wishes to send your gift via UPS. Only the US Mail will use a Post Office Box number. 2) Gifts should remain in the $5.00 - $15.00 amount. The point to this is to have fun and make it something that everyone that wishes to join in, can. 3) The gifts can be for the Pin kids or the owner, buyers choice. 4) Remember, your a SECRET Santa. When you place your return address on your package you will want to leave your real name off and address it from "MPT Secret Santa" with your full return address. PLEASE address your packages this way. Inside the package via a gift tag or card you can reveal your name. 5) Gift Opening night will be Dec. 27 th. We will all (or those that can) meet in the MinPinTalk chat room via Yahoogroups at http://groups.yahoo.com/group/MinPinTalk In the left hand margin there is a link to a group Chatroom. Chat will begin at 8:00PM CST. If you can't attend the chat feel free to open your gift but be sure to post and let us know what you got and who sent it!!!!! If you chose not to play along with Secret Santa you are MORE than welcome to attend the chat!!! 6) Packages need to be mailed early enough to reach your person by Dec. 15th. Remember to mail early because of holiday delays!!! If you are the Secret Santa for someone outside of the United States, Mail EARLY, EARLY, EARLY! It can take up to two weeks for your package to arrive. 7) Names and Addresses of your person will be mailed to you via private mail on Nov.1st. All members wishing to join in needs to have information to me no later than Oct. 31st. Secret Santa's: If your name does not appear below and you wish to join in OR have already contacted me and you are missing from the list Please let me know. REMEMBER! If you put your name in you MUST purchase and send a Secret Santa gift or someone will be left out of the fun!